Frequency Recordings, the sister label to the mighty Ram Records, is back. Set up in 2002 by Red One and Andy C, this label is synonymous with providing a platform for fresh talent to shine, including Hamilton, Basher, DC Breaks, Xample and Sub Focus. Not content with helping break new names, the label has also released music from household names such as Shimon, Moving Fusion and Vicious Circle to name but a few. 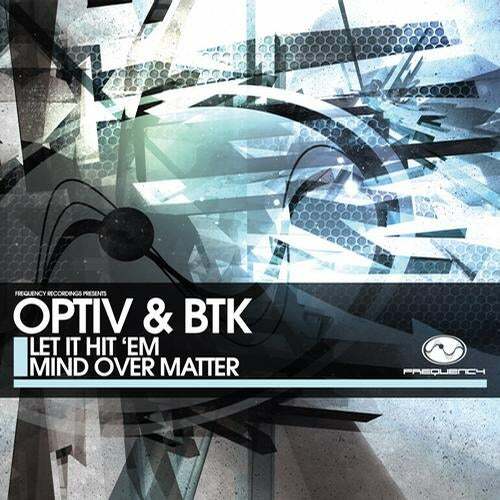 Frequency's latest release comes in the form of two absolute stompers from drum and bass' new super duo... Optiv & BTK. Having paired up on a number of tracks over the past year on various labels such a Renegade Hardware, Virus and Disptach Recordings, Optiv & BTK have once again brought their trademark sound and energy their tracks are becoming recognised for. Being one third of Cause 4 Concern, Optiv is regarded as of the most influential outfits in D&B, he has been dropping tracks of quality for well over a decade. BTK has been steadily gaining a reputation as one of the most exciting new producers to hit the scene in a long time, his tracks recieving support from DJ's such as Andy C, Ed Rush, Marky and many more. Linking up for a studio session they both realised they were on the same wavelength musically and havent looked back since. For their Frequency debut Optiv & BTK bring two slices of rolling tech funk. Kicking things off with Let It Hit 'Em, the shuffling percussive drums on the build up are just the calm before the inevitable storm, as once that raging synth line kicks in when it drops, you know there is going to be sheer carnage on the dance floor. With twisted sound effects and Dillinja-esque vocal stabs aplenty, this tune is definitely not for the faint hearted. On the flip, Mind Over Matter, brings a more stripped back sound, that is a pure roller from start to finish. Tight drums and percussive stabs compliment the driving bassline running through this gem of a track. This 12 is definitely a meeting of musical minds and is sure to set dance floors into a frenzy. Watch this space for more from Optiv & BTK and plenty more to come from Frequency Recordings.